The Cumbria Tourism team have been promoting the county at Ireland’s largest travel show, as they kicked off a month of trade events which will see them travelling not only the length and breadth of the UK – but also flying the flag for Cumbria in New York and Boston. As the county’s official Destination Management Organisation, representatives from Cumbria Tourism attended Holiday World in Dublin. 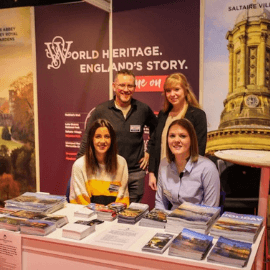 It’s the most prestigious annual event of its kind, bringing together more than 1000 holiday experts under one roof and was a prime opportunity to highlight the North of England’s World Heritage Sites to both potential visitors and tour operators. Cumbria Tourism is also heading to London for the Britain and Ireland Marketplace (29 January 2019) and then to Glasgow for the UK Inbound Convention (6-8 February). Both are key dates on the calendar for travel trade buyers and tour operators planning their itineraries over the next 18 months. Then in March, the team will be attending the British Tourism & Travel Show at Birmingham’s NEC, which is known as the leading event for the domestic tourism and travel industry.